COPIC CIAO 12 PEN SKIN TONE SET. This set includes 12 skin tone based colours. Set also includes the fantastic Copic blender for tone and blending effects. Each marker is equipped with both a medium broad and a super brush nib. Suitable for Manga, illustration and fine art. 100 Black E00 Skin White E04 Lipstick Natural E11 Barely Beige E21 Baby Skin Pink E35 Chamois E37 Sepia R02 Flesh R20 Blush R32 Peach YR02 Light Orange 0 Colourless Blender (COPIC COLOUR CODES). 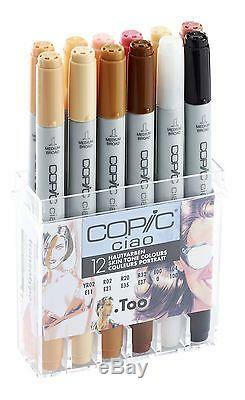 The item "COPIC CIAO MARKER 12 PEN SKIN TONES SET TWIN TIPPED 12 UNIQUE COLOURS" is in sale since Tuesday, August 13, 2013. This item is in the category "Crafts\Painting, Drawing & Art\Drawing Supplies\Pens & Markers". The seller is "artistmaterial" and is located in london, London.